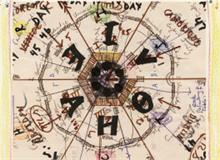 AVAM's The Art of Storytelling explores the impact of story via visual narratives, created by over thirty visionaries. 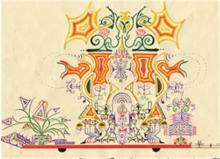 Andrew Edlin’s Wide Open Arts has acquired the Outsider Art Fair. The 21st edition moves to Chelsea’s Dia Center for the Arts. The Centennial of the Palais Ideal – Homage to Ferdinand Cheval consists mainly of French contemporary artists who are the ‘descendants’ of Ferdinand Cheval. Ariel depicts visions inspired by myths and legends, often exploring the world between heaven and hell. 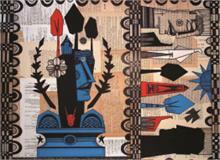 Kafou: Haiti, Art and Voudou is a major exhibition of Haitian art inspired by Voudou, with 200 works by 40 artists. 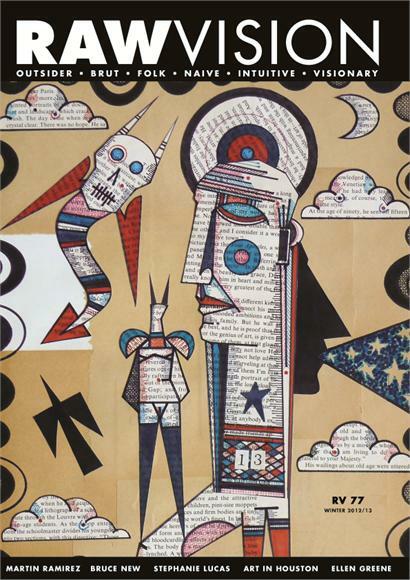 The Metro Show showcases a selection of works by outsider, art brut and self-taught artists, presented by preeminent galleries in the field. Farfetched explores backyard invention and technology on the edges of the Bell Curve, from perpetual motion and ufo design to purr generators and rubber chicken projectors. Outside In: National showcases 80 new works. Also the first major review of Dubuffet’s work in a public museum in the UK for nearly 50 years, features paintings, drawings and sculpture. Pascal Verbena’s assemblage sculpture, Holocaust, has been donated to the Collection de l'Art Brut by Sam and Betsey Farber. An exhibition at Zander Museum dedicated to Anna-Jutta Pietsch and Ralf Kay. CONNECT WITH US ON FACEBOOK & TWITTER TO STAY UPDATED! RAW VISION 77 IS OUT NOW! 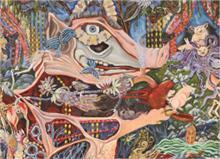 Lynne Adele explores the collage drawings of self-taught visionary artist, Bruce New. New employs his own consistent and complex visual language, conveying symbolic messages that are at once universal and extremely personal. 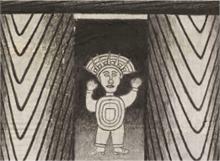 Looking at the mixed-media works on paper of the Mexican-born self-taught artist, who has secured a place in the outsider art field’s canon of remarkable talents, Edward M. Gómez asks: Who was Martín Ramírez? What does his work mean? John Devlin produced hundreds of images inspired by Cambridge architecture. His New Cambridge is a cityscape recreated on an artificial island in Minas Basin, Canada. Tony Thorne investigates these utopian visions of a heavenly city. Julie Thomson explains how beer, oranges and flowers led to monumental creations in Houston. 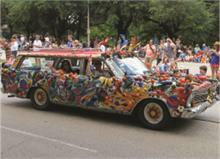 Unique visions inspired by ordinary things led to the stunning Beer Can House, The Orange Show, the annual Art Car Parade and the Flower Man’s House. Cathy Ward navigates Ian Ward's dream machines. His car drawings express a desire for a life less ordinary, and his starships and dream mobiles signal a means to transport him out of his suburban life and beam him down to the new planet of 60s London. 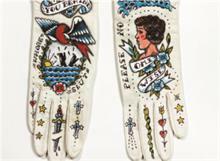 Alicia Eler looks at Ellen Greene's powerful kid leather glove designs, birthed from the artist’s visions, old school tattoo flash turned feminine power symbols, countless pairs of women’s hand gloves and ‘Invisible Mother’ Victorian photos. Roger Thompson explores the man-made natural realms of Stephanie Lucas, who calls her work ‘automatic drawing.’ She and her husband, who is also an artist, often paint side by side, with Lucas focusing on a fantastical, external natural world. Including a review on walla.! 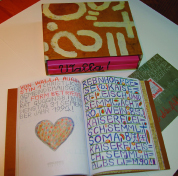 weltallende, the most substantial docmentation of Walla's work to date, edited by Johann Feilacher and published by Galerie/Museum Gugging, Residenz Verlag. Obituaries include Reverend H. D. Dennis (1916–2012) of Margaret's Grocery, Mississippi. 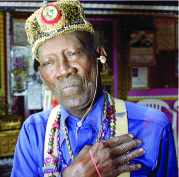 Raw Vision Magazine has been publishing for nearly 25 years and remains the world's only international journal of the art of the 'unknown geniuses' who are the creators of Outsider Art; an art created by untrained artists that is pure, exciting, raw, and that has real meaning and integrity. Subscribe to our high quality quarterly publication via our webshop.